THIS deal is all about patents. That was the near universal view of Google’s announcement this week that it was taking over Motorola Mobility, a maker of handsets and other devices, for a colossal $12.5 billion. Indeed, the purchase will provide Google with an awful lot of patents: around 17,000 of them issued and another 7,500 pending. They should help Google in its efforts to get more smartphones and other mobile devices running on its Android operating system (see article). But it could also make the battles over patents nastier and more costly. 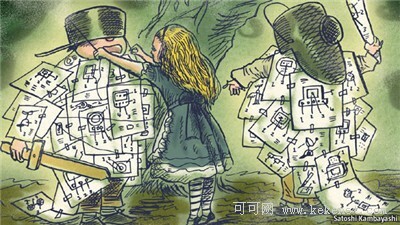 A scramble for patents had already begun. In December four companies, including Microsoft and Apple, paid $450m for around 880 patents and applications owned by Novell, an ailing software firm. In July those two and four others, including Research in Motion, maker of the BlackBerry, spent $4.5 billion on 6,000 patents owned by Nortel, a bankrupt Canadian telecoms-equipment maker. Before its latest deal, Google bought 1,000 patents from IBM. Firms are also suing each other. Apple claims its technology has been copied by Samsung and Motorola in their Android phones. Oracle is suing Google for up to $6 billion, claiming that Android infringes its patents. Microsoft is suing Motorola over Android too. Nokia recently settled a similar quarrel with Apple. What is going on? Some say companies are attaching more value to intellectual property. Indeed, the Google deal seems to have been priced on a cost-per-patent basis, causing the share prices of other firms with lots of patents to rise. Others, however, think the battles reflect deficiencies in the patent system forcing firms to pay vast sums to protect technologies they have developed. The answer is a bit of both. Kent Walker, one of Google’s senior lawyers, grouses at being forced to spend a lot of money defending the company against frivolous lawsuits by rivals. Others counter that as computing goes mobile, it favours information-technology firms that have invested in research for years and that Google was naive—or idealistic—to broaden its IT business without having a stack of patents. There is a retort to that, too: that incumbents can use patents as barriers to entry, which is why America’s antitrust regulators are showing interest in them. In April the Department of Justice demanded changes to Novell’s patent sale to protect open-source software. Nowadays, innovations in IT usually rely on many small improvements involving numerous technologies, which means it is not always clear precisely which inventions a patent covers. The open secret is that everyone infringes everyone else’s patents in some way. This creates an incentive for firms to build up their patent portfolios to strengthen their position in negotiations, leading to what some liken to an arms race. The legal tussles usually end in cross-licensing deals, in which small sums of money change hands. This is considered preferable to a mutually destructive exchange of endless lawsuits. 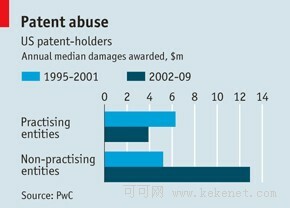 The patent battle has become more contentious than ever. One reason is the mobile phone has provided a new platform of computing that firms want to dominate. Also, such a backlog of applications built up at America’s patent office (now more than 1m, with a waiting time of around three years) that standards slipped. Dubious patents were granted, helped in part by court rulings that allowed patents to stand on some software and “business methods” that many thought no one could lay claim to. In Europe and Japan, where patentability standards are higher, this is less of a problem. Making things even more troublesome is that as lawsuits became particuarly lucrative some companies entered the fray to feed off them. Non-practicing entities (NPEs), which have intellectual property but no actual products, include such august bodies as the Harvard Medical School. But some NPEs are derided as “trolls” because their sole purpose seems to be to exploit the legal system by demanding licensing fees from companies, sometimes for questionable patents. Over the past 15 years, the median award to NPEs of damages for patent infringement has doubled while that for other firms has declined (see chart). Court rulings in America have begun to clip the trolls’ beards by making it harder to win injunctions and by strengthening the criteria for whether an invention is truly “non-obvious”. Microsoft has seen the number of suits filed in the famously plaintiff-friendly district court of Eastern Texas fall from 17 in 2007 to just two so far this year, says Brad Smith, Microsoft’s general counsel. However, as big companies have improved their defences, the trolls have changed their tactics and are now going after start-ups. New legislation could change things. David Kappos, director of America’s patent office, says the America Invents Act could amount to “the most sweeping reforms to the US patent system in 175 years.” It is expected to be passed this autumn, Barack Obama has indicated that he will sign it, and big IT and drug companies support it. But many entrepreneurs and venture capitalists do not, arguing that it does not fix any of the system’s big problems and risks creating new ones. The most contentious point is a change to determine who is the rightful inventor. Instead of being the “first to invent”, the successful applicant would be the “first to file”, the standard used worldwide. Harmonising America’s rules with those in other countries would be a step towards greater co-operation and efficiency in patent examinations globally. Big companies like the proposal because it gives them more legal certainty that someone will not appear claiming they came up with the idea first. But inventors like Steve Perlman, the founder of WebTV and other firms, argue that it forces companies to file for patents before their inventions are fully developed. That, says Mr Perlman, would lead to yet more incremental improvements rather than big innovative steps and put a toll on America’s competitiveness.